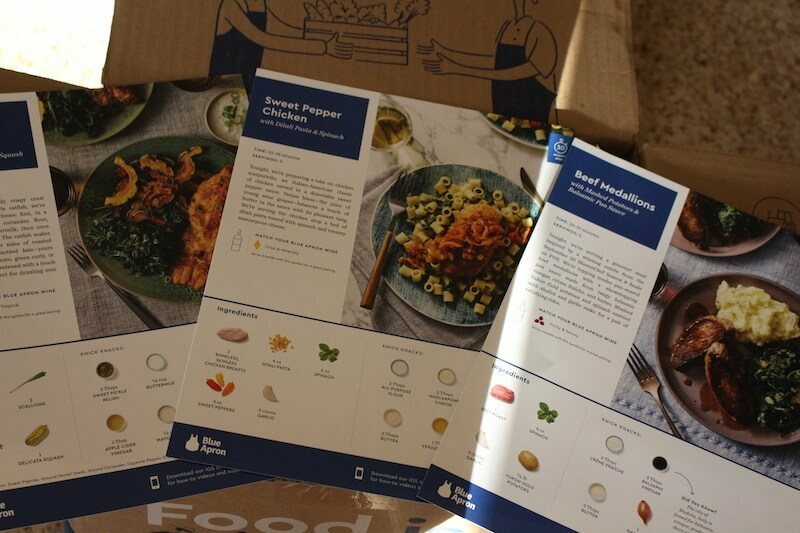 Blue Apron Meal Kit Delivery Review: Is It The Best? Or Just The First? Blue Apron is a solid service. They have great tasting, healthy ingredients and delicious recipes each week. They are also on the inexpensive side when comparing to similar meal kit delivery services. Plus, there's a wine club! There's a lot to like about Blue Apron. However, after being a member for a few months I found that their recipes become stale. They'd be a great "first time" option for someone trying a meal kit service, but definitely keep your eye out for others. There's a lot of options available! Blue Apron was the original meal kit delivery service. They've been advertised on just about every podcast, and definitely every food-themed YouTube show. You've probably heard them on the radio too. I cut my cable a long time ago. Are they on the TV too? Doesn't matter. You know who blue Apron is. But are they still the best meal kit delivery service? Are there better options out there? Since there are a million other Blue Apron reviews out there, for this article, I really want to see if Blue Apron is the best, or if was just the first of its kind. 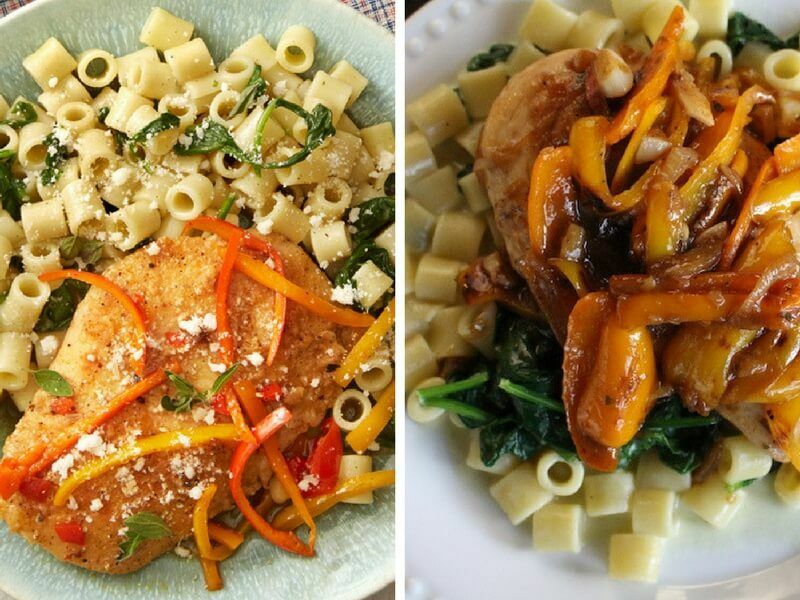 Signing up is relatively straightforward with Blue Apron, which has its pros and cons. In three simple steps, you can be signed up and ready to receive your meals. $9.99 per serving ($8.99 for families) is on the cheaper side of the spectrum for meal kit delivery services out there. Some of the specialty ones that have paleo, keto, or gluten-free option can run up to $15 per serving! However, the downside for some people will be that they simply don't have the customizable options of other services. If you have any food allergies, unfortunately Blue Apron does not cater to that. As a person that eats anything and has no allergies, this didn't bother me in the slightest, but I know that some people join meal kit services to make shopping for special diet requirements easier. For prepared meals (delivered fresh or frozen, ready to heat), here's the full list. There's also a wine option, which not all services offer (although Hello Fresh does!) The wine delivered is relatively inexpensive, although you don't get a full bottle. You get 500 ml, which is about enough for two people to have two glasses each (standard wine bottle is 750 ml, which is six glasses). $10 per bottle is very reasonable, considering you'd normally have to pay about $15 for a decent bottle of wine (in California). However, you do have to pay shipping and tax on that, so your bill will come out to $66+ just for wine for the month. 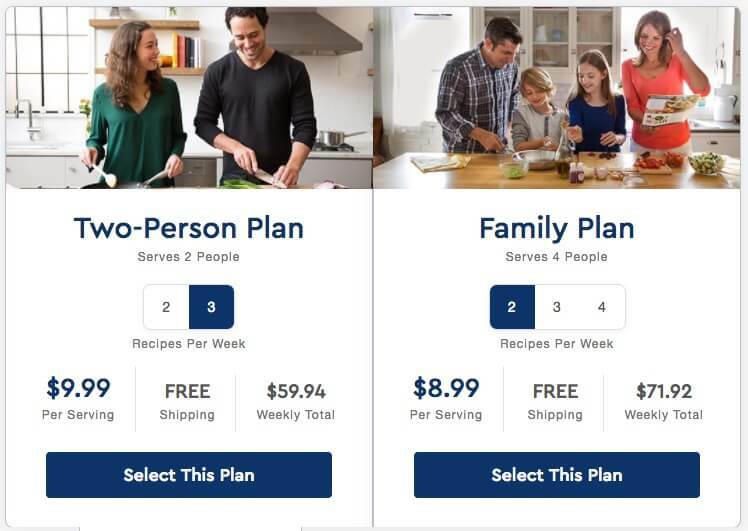 Plus the $240 per month, assuming you're on the 3 x 2 plan and don't skip any weeks, your monthly budget will be over $300 just for meals per week. I'm not sure how this compares to your normal budget, but I thought I'd work out the math for you. To some, this is a crazy amount since you can buy relatively cheap food and make great recipes at home for about $5 per serving. Others say that they normally spend that much anyway, and with Blue Apron you have fewer leftovers. Plus, it's fun, and paying a few extra bucks to make cooking less of a chore is worth it. Personally, I love meal kit delivery services. But will Blue Apron be my “go to” service of the 20+ services available now? Keep reading! Oops, I forgot to mention that YES, you can choose your meals. Once you sign up, you can just let them send whatever, or you can see what's on the menu and exchange a meal for something better suited to your tastes. Since I work from home, I can pretty much intercept all packages that are shipped to our home. However, a few times I've missed packages. In fact, one time during fall of last year it was left overnight. Because the weather was cool, all the food and meat stayed cool and everything was still good by the next morning. One thing that I don't like about Blue Apron is that their food is just thrown into the box and mixed together. Everything is labeled properly, but the meals are mixed up so you have to sort everything out when it's time to cook. Looking at the bigger picture, I guess I can spend an extra 2 minutes and reduce packaging waste, but as long as the packages are recyclable, it's all the same, right? It's not a big deal at all, but it is different from many other services which separate their meals by bags. I was a member of Blue Apron before I started this blog for several months, and was happy with their service for that time period! I found that they delivered a wide variety of types of meals, and it took some of the monotony out of the routine meals that I cooked. However, I found that after a few months I started to get bored with the recipes. It was a lot of the same types of meats: cod, salmon, steak, chicken breast/thigh, ground beef, pork chops. Where's the lamb and duck? What about a wider variety of chicken, pork and beef cuts? It was a lot of the same cooking techniques as well, and I just got bored with it. Once I realized I was paying $20 per meal for average food, I canceled. For me, it really has to be something exciting to make it worth staying on more than a few weeks or months. Whether it be unique cooking, or a unique cut of meat, or a new spice I've never tried…I need that variety. Otherwise I could just save 80% of the cost and make it myself. This time around, my Blue Apron subscription was pretty much the same. It was delicious, don't get me wrong. But it's hard to pay $20 for chicken and pasta you make at home. 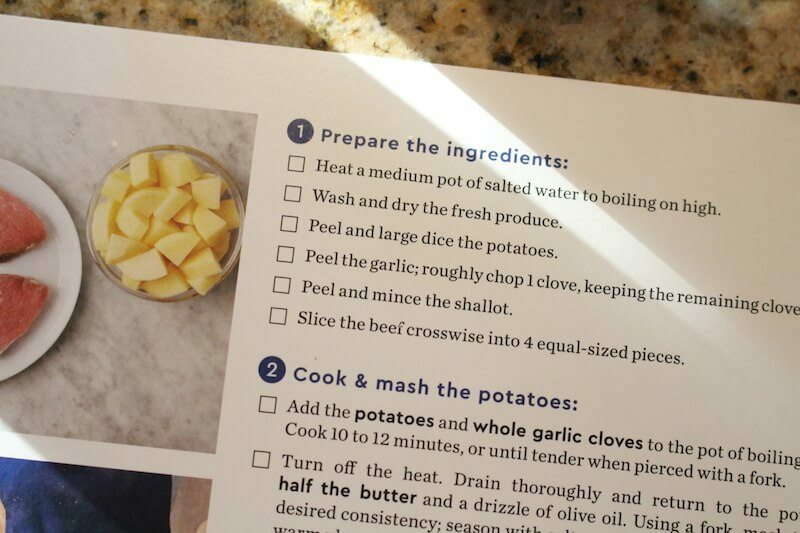 One thing I really like about this particular brand is that their recipe cards have very clear instructions. Some other services, I tend to mess up things here or there, like if it's a new cooking technique I haven't tried before. In this recipe, I really liked working with “verjus”, which is a young wine grape used to sweeten the sauce. It was just something I'd never used before. I like my sauces extra thick, so I cooked the reduction a bit longer and got a nice, sweet pepper sauce for the chicken. Those little noodles are super hard to pick up with a fork though! I've never been great at frying stuff crispy. Somehow the breading always comes out terrible. Today was no different! I did however really like the taste of the delicata squash. I'd never tried that one before. The beef here was pretty “meh”, but the potatoes tasted super fresh. Delicious! Although the balsamic pan sauce tasted great, I think I thickened it too much because it just plopped onto the steak instead of having a nice juicy finish like in the photos. So far, I haven't canceled so I'll update this section later. I really want to try their wine service to test if they actually pair the wine with the meals or if they just send you a random bottle. Personally, I prefer the food from Sunbasket over Blue Apron. I thought they had more meal choices, and each meal was more unique. There seemed to be more choices for exotic or fun meals, rather than the standard “meat and potatoes”. However, I was a member of Blue Apron longer, so my perspective may be skewed. When all of these week-long reviews are done, I'll go back and subscribe to my favorite services for a month or two and see how my opinion changes. Keep in mind, Sunbasket is more expensive! It's about $13.50 per serving as opposed to $9.99, so you definitely pay extra! I found it was worth it to have a “special” meal a few times a week and pay the premium price. Hello Fresh is also on the cheaper side, but I was not impressed with their meals. In fact, I had issues with their customer service too, so they are generally not on my recommended list. However, if you can snag a discount for a new member trial, they are worth doing for a week or two. 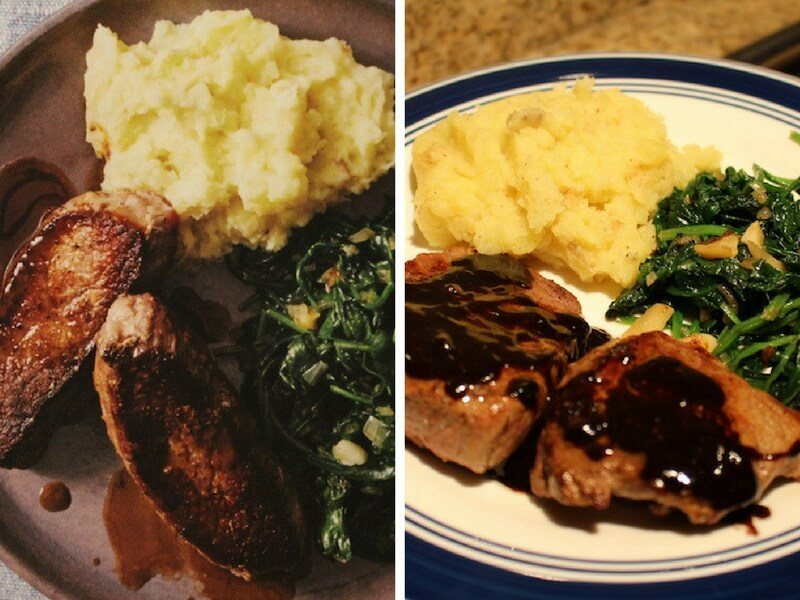 Home Chef does much better with delivering inexpensive, decently-creative meals. Overall, after trying more than 10 meal kit services, I still consider Blue Apron a great go-to, trustworthy meal kit service. 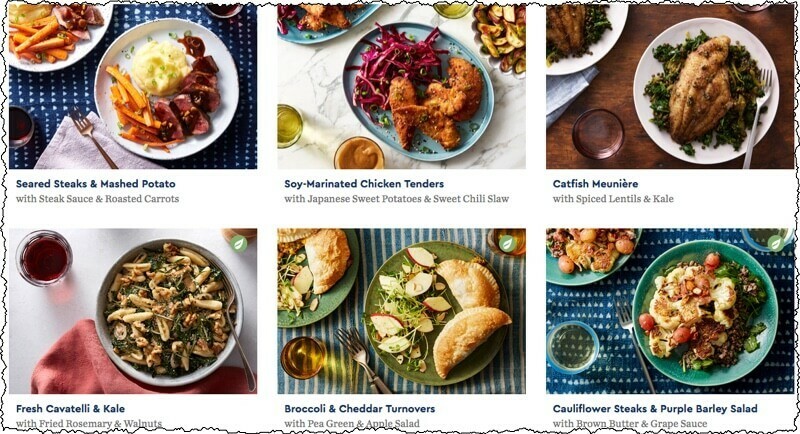 Of course, it's fun to shop around and try what's available out there, but Blue Apron was able to deliver consistency good meals and fun recipes. Plus, their wine club is amazing. It's simply the best food/wine pairing club I've ever tried. They do an awesome job of teaching you about the wine, while you drink it, and which foods to pair it with. I haven't finished my full review of their wine club yet, but I'll update here when it's done. ==> Sign Up To Blue Apron Here! I've decided to give Blue Apron a third try, so I can test out their Wine Service. After browsing the current menu…I'm starting to rethink my original assessment of Blue Apron meals as “boring”. They looked really tasty! Perhaps they are working harder on developing irresistible recipes. Honestly, that's the main reason I quit, so I can't be the only one. If they could consistently offer a decent variety of amazing-looking meals, I might stay a member longer. To be honest, even though I've “quit” Blue Apron several times, I've also come back to their service consistently. They area solid offering compared to some other meal kit companies I've tried which can be hit and miss! 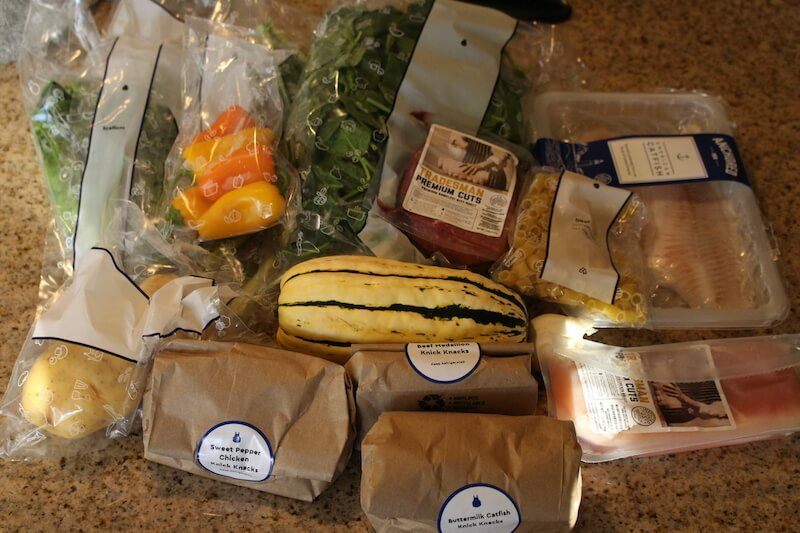 You are here: Home / Blue Apron / Blue Apron Meal Kit Delivery Review: Is It The Best? Or Just The First? Some links on my website contain affiliate links. That means I make a commission from sales of things you buy if you click the links on the pages here. However, I always write honest reviews and sponsored posts are always labeled as such. Just wanted to let you know! Hi! My name is Rick and FoodForNet.com is just a website about food and drink that I like. That includes sous vide, slow cooking, grilling, smoking, and homemade pizzas. I also make my own beer, wine, cider, kombucha, and sake… and am a whiskey enthusiast! 23 Keto Almond Milk Smoothie Recipes: Dairy Free, Soy Free, Coconut Free! Copyright © 2019 · Food For Net · Food...For The Internet!